Tafaraji: Mr. Obama Goes to Oslo, Norway: Recipient of the 2009 Nobel Peace Prize! Mr. Obama Goes to Oslo, Norway: Recipient of the 2009 Nobel Peace Prize! As you know, the Nobel Peace Prize is on of the five Nobel Prizes bequeathed by the Swedish industrialist and inventor Alfred Nobel. 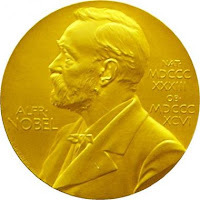 According to Nobel's will, the Peace Prize should be awarded "to the person who shall have done the most or the best work for fraternity between nations, for the abolition or reduction of standing armies and for the holding and promotion of peace congresses." The Peace Prize is presented annually in Oslo, Norway, on December 10th (the anniversary of Nobel's death,) and is the only Nobel Prize not presented in Stockholm, Sweden. In the title I've linked to the Nobel Prize web-page where they convey stories of phone calls they've made to other prize winners. "Minutes just before the announcement, the Prize Awarding institution calls the Nobel Laureates to inform them that they have been awarded the Nobel Prize. These call can come at unexpected times and reach Nobel Laureates in unexpected places. Hear are some recollections of those special moments when the "magic call "came through": Click title link.